1880s autograph album of Will P. Wight of Otisfield, Maine, and East Douglas, Massachusetts. The album is approximately 7-1/2" x 5" and contains the sentiments of over thirty of Will's relatives and friends in Maine, New Hampshire and Massachusetts. Will P. Wight, or William P. Wight, was born about 1857 in either Nova Scotia, New Brunswick or Hingham, Massachusetts, depending on the differing information on records. He was the son of Jesse D. Wight and Eunice Aurelia (Riley) Wight, who were born at Otisfield, Maine, and Ardize Hill, Nova Scotia, respectively. Either Eunice alone or her family had moved to the Hingham, Massachusetts, area, where Eunice was living at the time of her marriage to Jessie D. Wight. Jesse was working as a blacksmith there or at Otisfield, Maine. Eunice Aurelia (Riley) Wight signed a page in her son Will's album. 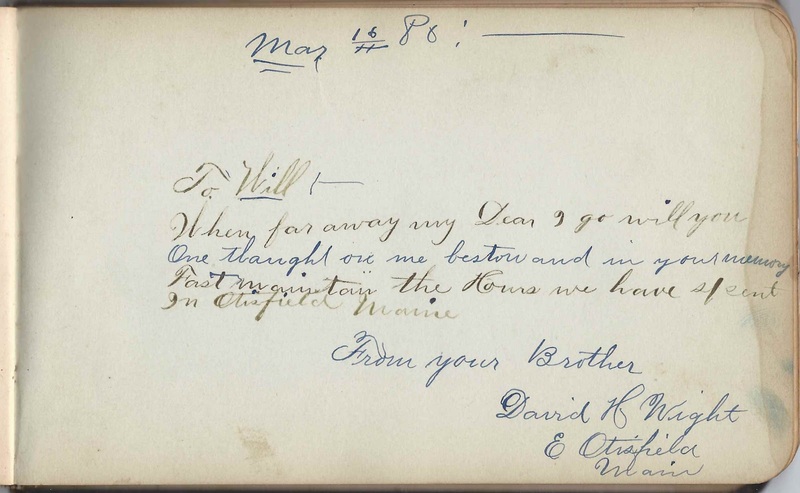 Will's brother David H. Wright signed a page near the front of his album. Will's paternal uncle Joseph Perley Wight, his wife Diantha J. 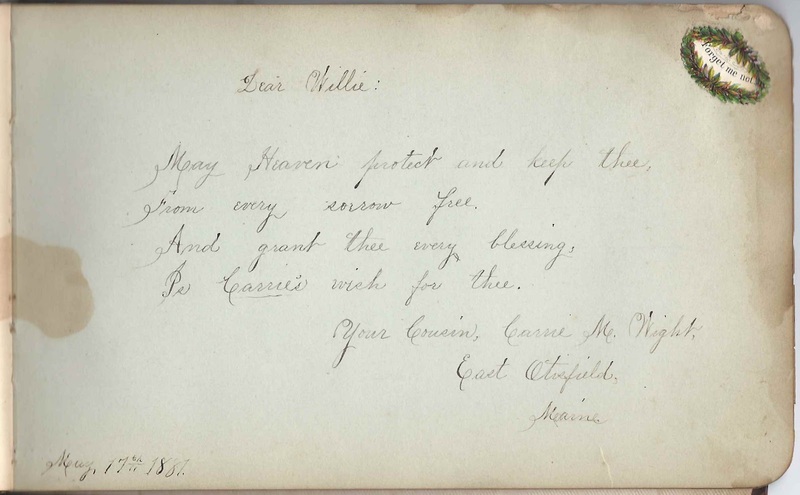 (Morse) Wight and their daughter Carrie M. Wight signed pages in Will's album. In the 1880 Census, Will P. Wight was living in the home of his parents at Otisfield, Maine, but apparently soon after he moved to East Douglas, Massachusetts, where he was living at the time he started compiling autographs in his album. Shortly after his arrival in Massachusetts, apparently, he married Harriet Simpson, who was born about January 1858 in Massachusetts. I found a birth record for a Jesse E. Wight, born to Will and Hattie, on 21 October 1882 at East Douglas, Massachusetts. If you have corrections and/or additions to the information above, or information on any of the signers mentioned below, please leave a comment or contact me directly. Thanks! 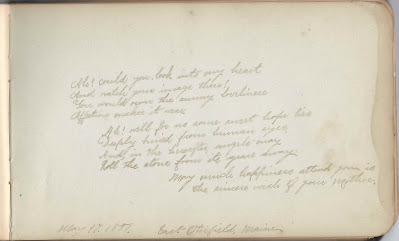 Edith M. Briggs, signed at Wayne, Maine, on May 18, 1881. Her surname runs off the page so that only Brig is visible, so her surname may be something other than Briggs, but where there was an Edith M. Briggs living at Otisfield, Maine, in the 1870 Census, I think Briggs is correct. Emma J. Clement of Nashua, New Hampshire, signed on May 11, 1881. "When treated with apples always select the Baldwins; they are the best." 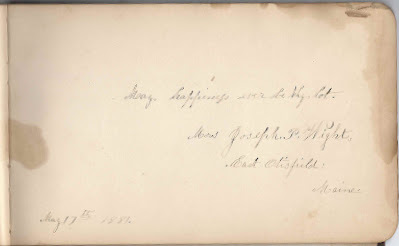 G. Coburn [not sure of surname], signed at Nashua, New Hampshire, on May 12, 1881; middle initial might be U or N or H or ? Horace Eugene Dawes of Harrison, Maine, signed on May 17, 1881 at the age of 8 months. This was signed in a nice hand so it wasn't a case of someone helping Horace write; rather, someone else, possibly his mother Pamelia R. (Wight) Dawes, or his grandmother Eunice Aurelia (Riley) Wight signed for him. 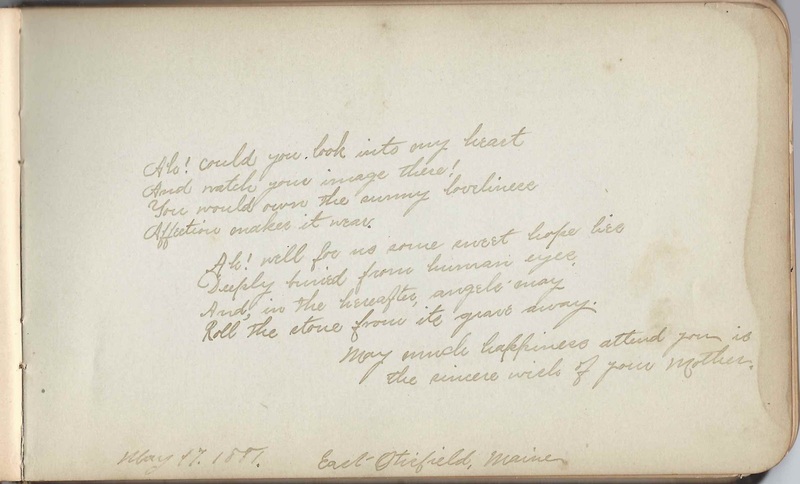 Eunice signed the following page, and the handwriting is very similar, so I believe it was she who signed Horace's page. 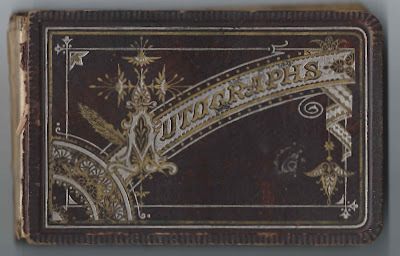 Cora E. Payson, signed at West Waterville, Maine, on Juy 31, 1881; she signed upside down on the page. 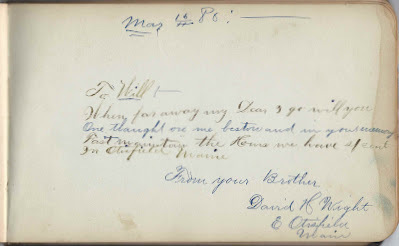 E. J. Stevens of West Waterville, Maine, signed on July 31, 1881; has a note in the corner from "Mother"
Ornate handwriting that's hard to decipher but looks like F. Vining of Nashua, New Hampshire, signed on December 18 [no year] written "by old Sliver". Middle initial could be S or P or ? Eunice Aurelia (Riley) Wight, signed as "Mother", at East Otisfield, Maine, on May 17, 1881. 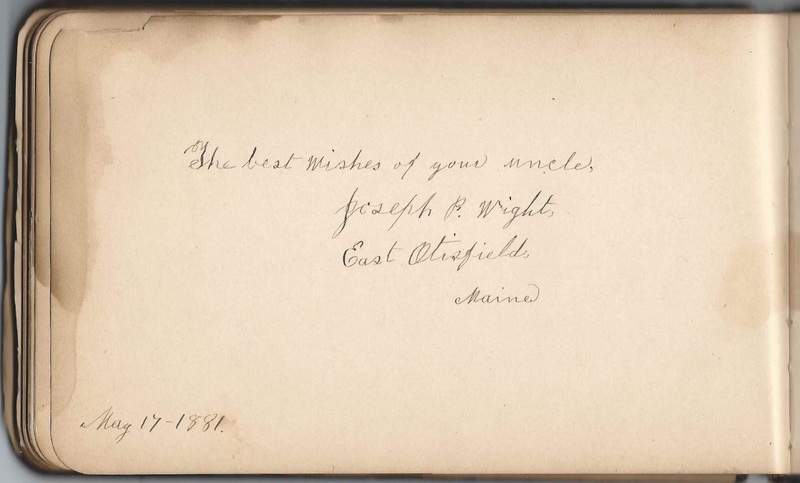 Joseph P. Wight of East Otisfield, Maine, signed on May 17, 1881; Will P. Wight's uncle. He was Joseph Perley Wight, brother to Will's father Jesse Dunham Wight. Joseph's wife, Diantha J. (Morse) Wight, signed the facing page. 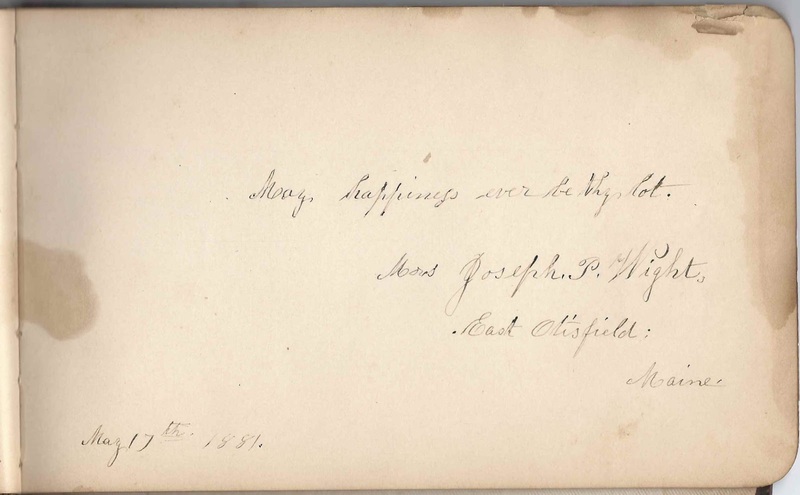 Mrs. Joseph P. Wight of East Otisfield, Maine, signed on August 17, 1881. She was Diantha J. 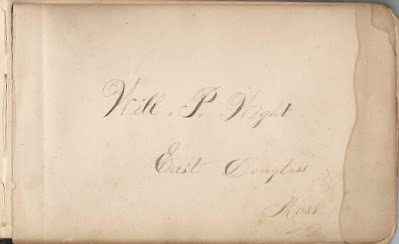 (Morse) Wight, wife of Joseph Perley Wight, Will P. Wight's paternal uncle, who signed the facing page.